Even though there is no hard evidence, we’re ready to say that drivers in the US who row their own gears are safer from car jackers than those who don’t. What makes us think this? Well, there was the story of a St. Louis man whose Nissan Altima was about to be stolen before the thief tried and failed to get it from neutral to first. Then there’s this, a report from Cleveland.com about 18-year-old Damari Wayne, a serial car jacker who was busted thanks to the fact that neither he nor his accomplice could drive stick. On February 11th Wayne stole a car. He was charged for the crime on February 13th. He posted bond and a little over a week later was at it again. The 18-year-old and a 17-year-old accomplice car jacked two people on the night of the 21st. The first victim drove an automatic. The second didn’t. According to Cleveland police, Wayne threatened to kill the 23-year-old victim if he didn’t get out of the car. The guy obviously complied, but when he handed over his keys and phone the pair was unable to speed away as the car was a manual. Like an idiot the 17-year-old kid pointed his pellet gun at the victim, who tried to explain how a clutch pedal works. The pair eventually gave up and fled with the stolen phone. Cops tracked the phone and arrested the two. As we’ve said before, stories like these aren’t the norm. If you want to keep your car safe from thieves there are a variety of things you can do that are more effective than driving stick. Still, you never known when that third pedal will come in handy. Save the manuals and save yourself from having your car stolen at the same time. 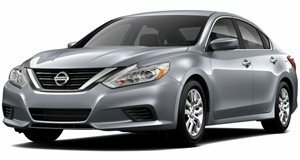 The facelifted Nissan Altima sedan is a decent offering in this competitive segment.